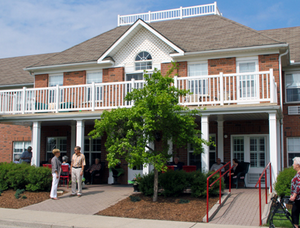 St. Jacobs Place offers luxury independent / assisted living in one of Ontario’s rural gems, St. Jacobs, Ontario. Seniors will appreciate the atmosphere of this quaint and charming little village. Surrounded by the tranquility of rural farmland in the heart of Mennonite country, situated in the peaceful and old-fashioned village, St. Jacobs Place is the best of both worlds; modern luxury accommodations with health care services, within the homey warmth and comfort of a country lifestyle. Wholesome and delicious country home-style cooking and baking is just the beginning of this rural country retirement community. St. Jacobs Place is independently owned and operated by. Local hands on ownership contributes to the understanding of the culture of the area and the needs of the seniors who choose to call St. Jacobs Place their new chosen home. The facility is modern, clean, well-appointed and well-equipped to provide the luxury care St. Jacobs Place is renowned for, but it is the staff that really make the difference. Everyone at St. Jacobs Place is fully dedicated to nurturing the well being of our residents. With sincerity and integrity, the staff, the owner and the volunteers are fully dedicated to nurturing the well being of Residents within St. Jacobs Place. Their desire and commitment is to meet the collective and individual needs of our valued Residents. With so much to do within a short walking distance such as the unique shops and crafts, excellent restaurants, a choice of places of worship, and walking trails along the river, St. Jacobs Place lives up to its reputation for luxury independent and assisted living.